They face wind chills as cold as -60°C (-76°F) and blizzards of 200 km/h (124 mph). Despite such harsh conditions, emperor penguins spend their entire lives on the ice or in the surrounding waters of Antarctica. To survive in this severely frigid climate, emperor penguins are equipped with several special adaptations. Four layers of scale-like feathers protect them from icy winds and provide a waterproof coat. The penguins can store large amounts of fat which insulates their bodies while also serving as a long-lasting energy source. They have small bills and flippers, which helps to conserve heat, and special nasal chambers that minimize the heat normally emitted through exhalation. Because their arteries and veins are situated close together, emperor penguins have the ability to recycle their own body heat. With this system, blood is cooled down on the way to the penguins’ extremities and warmed up on the way back to the heart. Emperor penguins are also specially adapted to traveling in this extreme habitat. On the ice masses, they use strong claws on their feet to help grip the surface as they shuffle along. They also slide on their sleek bellies while pushing with their feet. At sea, emperor penguins glide through the water with great speed and agility. Their aerodynamic bodies and strong flippers make them excellent swimmers, reaching speeds of 3.4 m/s (7.6 mph). They can dive deeper than any other bird – as deep as 565 m (1850 ft.) – and they can stay under for more than 20 minutes. Every winter (which begins in March in Antarctica), emperor penguins traverse up 80 km (50 mi.) across the ice to reach stable breeding grounds. Males arrive shortly before females, ready to attract a mate with displays and courtship calls. Emperor penguins are monogamous during each breeding season, choosing only one mate. Most will find a new mate the next year, but some pairs choose to reform a bond again. Once the egg is hatched, in May or June, the female will pass the egg to the male to incubate. She will make the long voyage back to the sea to feed on krill, squid, and fish. As there are no nesting supplies available on the ice mass, emperor penguins must create a safe, warm environment for the eggs using their own bodies. Careful to keep the egg sheltered, the male will balance the egg on his feet and cover it with a warm layer of feathered skin called a brood pouch. In the next couple months, the male emperor penguins must cope with the worst weather conditions on earth, all the while eating nothing. To withstand the harsh winds and blizzards, the penguins huddle together in groups. They take turns moving towards the inside of the pack, where it is warmer, thereby sustaining the entire group. Once the females arrive back at the colony, they regurgitate food for the hatchings to eat. At this time, the males can finally return to sea to fish, and the females will continue care for the chicks. After a few months, the juveniles leave the shelter of their mothers’ brood pouches and stay in chick groups called crèches. This allows the females to go fish. 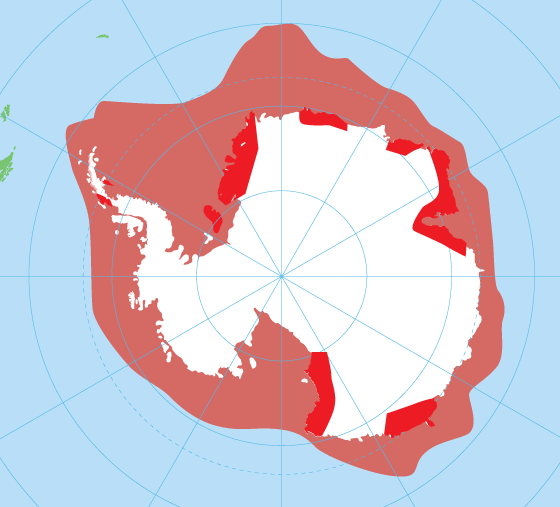 In December, the weather warms in Antarctica, breaking up the outer ice and bringing the sea closer to the nesting sites. When the young penguins reach the water, they are nearly done with their moult, and they’re ready to swim and fish on their own. Adult penguins begin their yearly moult once separated from their offspring. They store up body fat beforehand because it takes a lot of energy to replace all their feathers, and they are unable to fish because they lack waterproof protection. By January, the new plumage has grown in, and the hungry penguins take to the waters in groups to forage for the summer. 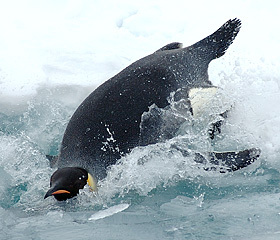 Although emperor penguins are effective hunters, they are also prey to a few Antarctic animals as well. Only a third of the juvenile penguins will make it to their first birthday, falling prey to seabirds like giant petrels or skuas. In the water, both juveniles and adults are eaten by leopard seals and killer whales. 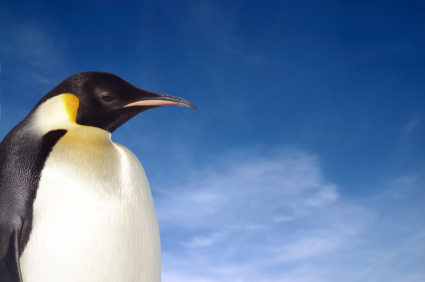 According to the IUCN Red List, emperor penguins are considered near threatened. They currently have a large range and they live on average 15-20 years in the wild. 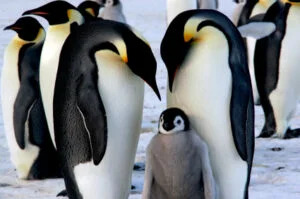 However, emperor penguins face several threats due to human activity. Rising temperatures due to global warming will reduce emperor penguin breeding grounds and overfishing will limit their source of food. It is projected that their population will decline rapidly over the next three generations as a result of climate change. Further, studies have shown the appearance of Infectious Bursal Disease Virus (IBDV) antibodies in emperor penguin chicks. IBDV is a highly contagious poultry disease that was most likely brought to Antarctica via humans exposed to infected birds. More studies are currently being conducted to measure the effect of the disease on emperor penguin populations. If you would like to help emperor penguins, you can reduce carbon emissions which lead to global warming. Some measures include walking, biking or taking public transportation instead of driving, using energy saver appliances and light bulbs, buying locally grown produce, reducing your consumption of manufactured goods and packaging, recycling, and more. To learn more tips, see StopGlobalWarming.org. You can also donate to charities to help preserve emperor penguin habitat or adopt a penguin through WWF. Emperor penguins spend their entire lives on the ice or in the surrounding waters of Antarctica.